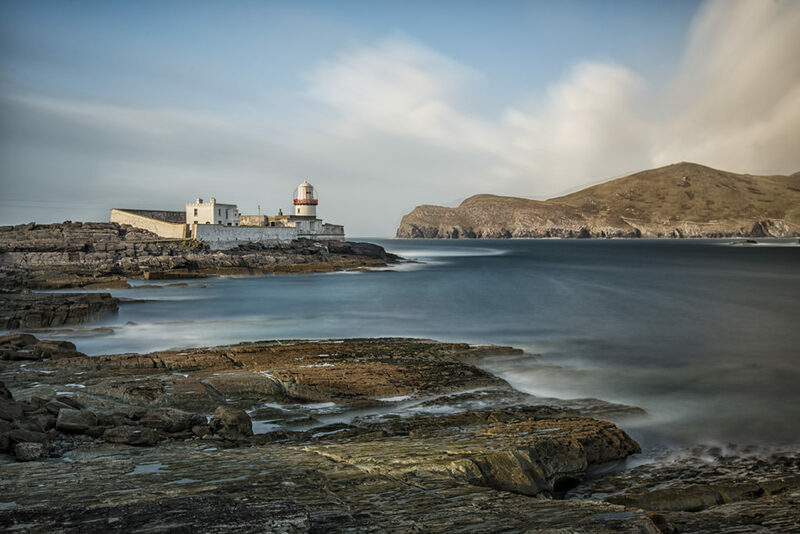 Valentia Island Lighthouse stands at the western end of the Iveragh Peninsula, guarding the southern entrance to Dingle Bay in County Kerry, in the southwest of Ireland. It is a harbour light, whose purpose is to guide vessels from the sea into Valentia harbour, past the treacherous Harbour Rock. 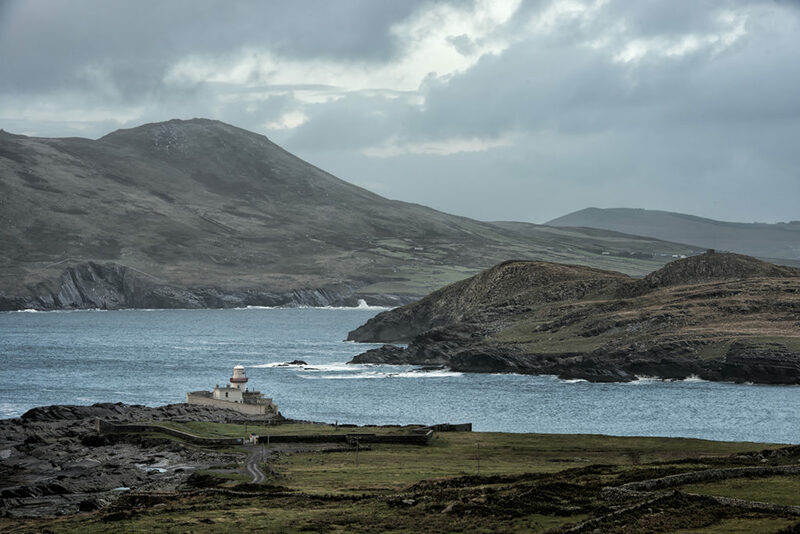 Visible across the water, on the north side of the bay, is Dingle Peninsula, with Slea Head at its westernmost point, jutting out into the Atlantic Ocean. The lighthouse itself stands within the confines of Cromwell Fort, a walled compound containing a white barracks building. A fort has stood on this spot since the middle of the 16th century and the first lighthouse was built on this scenic headland in 1841. For more than a hundred years from 1841, the lighthouse was maintained by a single keeper, who lived on the premises with his family. The lighthouse was automated in 1947. For anyone who grew up listening to the shipping forecast on BBC Radio, as I did, the name “Valentia” carries with it all kinds of romance, mystique and danger, as it is also one of the thirteen coastal weather stations serving the British Isles. From my childhood, I recall the regular gale warnings issued for the Valentia shipping zone. They always conjured up in my mind grim images of brave sailors battling high winds and heavy seas off Ireland’s southwest coast. 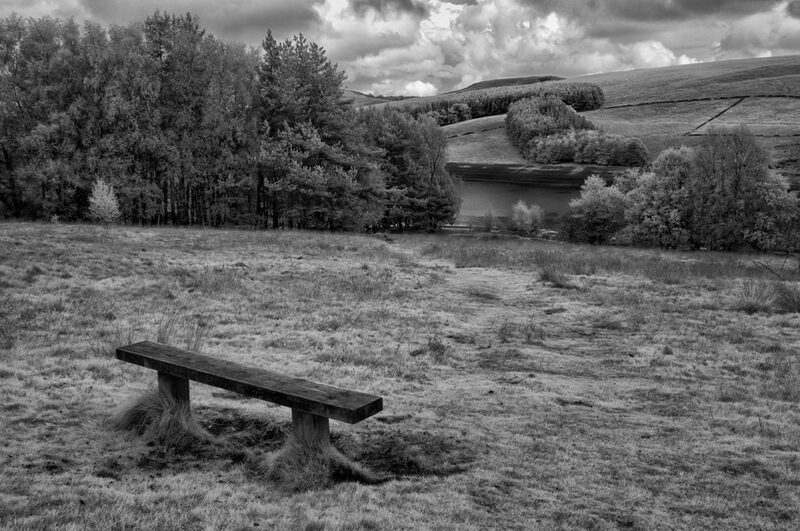 From the Goyt Valley of Derbyshire, England. I arrived in England this morning and headed straight to the Peak District, a place that I have long wanted to visit and photograph. My flight touched down in the dark at 6:30am and sunrise was at 7:28am but, by the time I collected my luggage and hire car, hit the road and reached the Goyt Valley, it was almost 10:00am and the sun was already quite high in the sky. 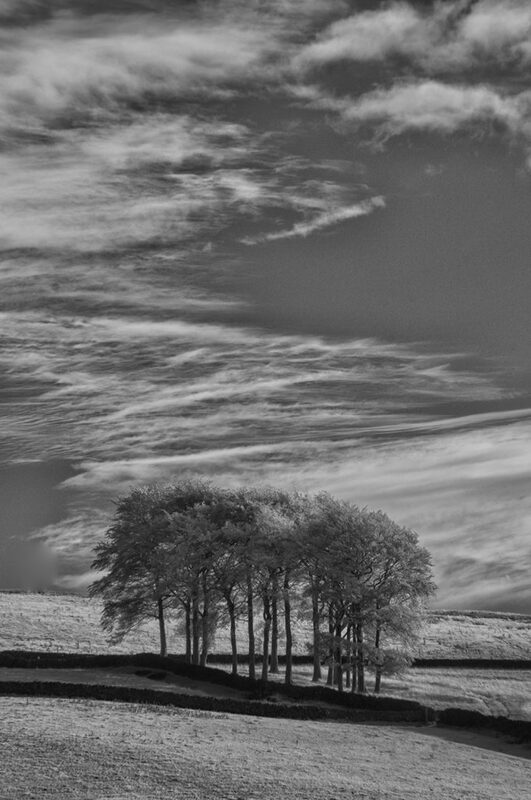 Too bright for colour, so infrared was my choice. The Peak District is a rabbit’s warren of impossibly narrow roads, aged stone walls, photogenic trees, dramatic hills and, in mid-October, intermittent showers and so-so light. On a few occasions, I managed to stop and get the shot but ended up with an unusable image due to nondescript light. Looking on the bright side, I found some good locations and have two more days here to re-visit them, in hopes of shooting them in better light. While photographing from one of Venice’s many picturesque little bridges, a gondola passed directly beneath me. It startled me at first and I hurried to adjust my camera settings to capture a sharp image of the gondola as it passed by. But, being the slow-working photographer that I am, I failed miserably and captured an image of a sharp background and a blurred gondola. 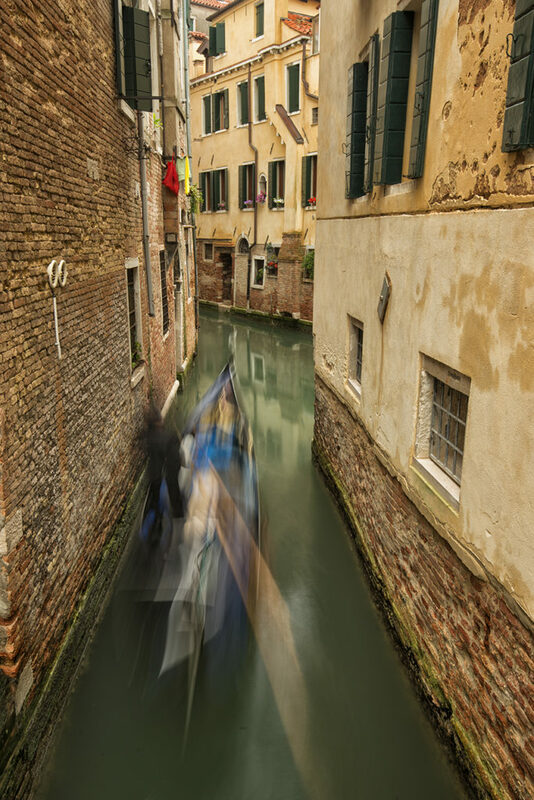 But this turned out to be a blessing in disguise because I really liked the blurring of the movement of the gondola against the sharp background of the walls of the narrow canal. 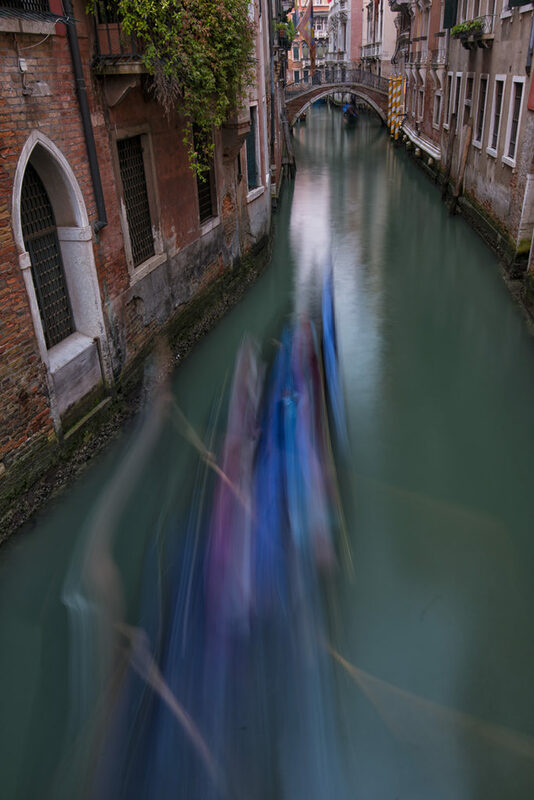 Somehow, the blurred movement of the gondola seemed evocative of the romance of Venice in a way that a sharp capture could not be. And so, I started deliberately looking for picturesque bridges with gondolas passing underneath. Happily, these are not difficult to find in Venice. I set my camera up at the lowest possible ISO of 100, used a circular polarizing filter to reduce the glare of the sky reflecting on the water and this produced a shutter speed of four seconds, rising to six seconds as the day wore on and the sky dimmed. It turned out that the few sharp images of gondolas I shot were unattractive because they showed the garish apparel of the passengers: pink lycra sports tops, electric blue rain jackets and sickly green umbrellas. 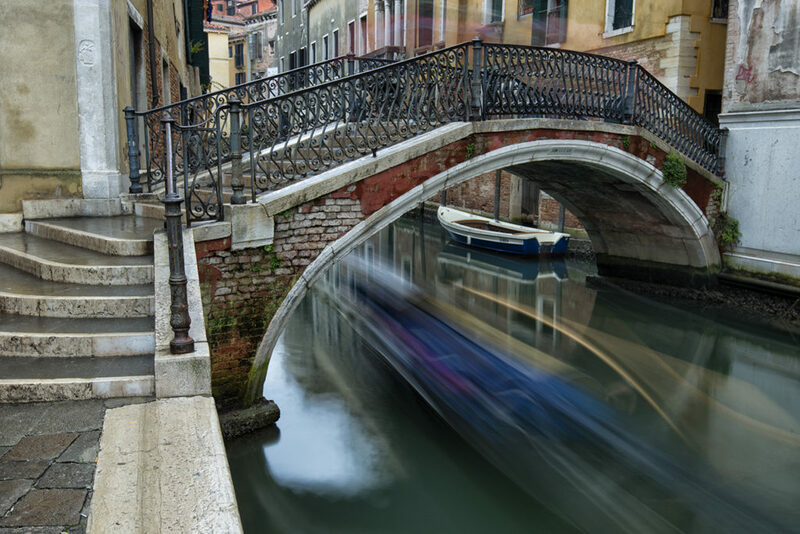 Far better to disguise the detritus of everyday life under the tasteful blur of a six-second exposure and thus preserve the romance of Venice’s ancient canals from the intrusion of modern life.